In less than two weeks, on the 7th May, the most important day for the last and next five years will be on us. Yes, it’s the release of a whole host of YA and MG novels, including my very own Joe All Alone. 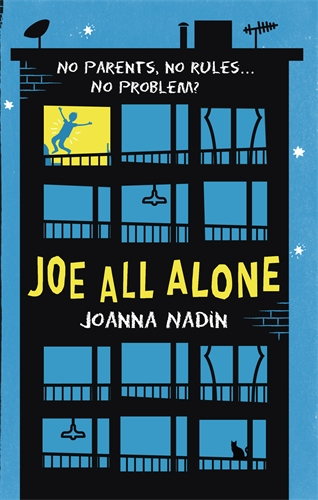 Left home alone when his mum and her skeezy boyfriend fly off to Spain, Joe is at first delighted with his freedom, and makes friends with Asha across the hall in his block, who’s hiding out at her Grandfather’s flat. Together they explore Peckham and their own relationship. But then the money runs out and the net closes in – thrown by school bullies, and Dean’s dodgy mates – and Joe has to make the biggest decision of his life. It’s not an easy read – it’s bleak and brutal in parts. But, as the writer Rhian Ivory points out in her review, it does offer some big, fat HOPE, which we can all use some of. Also biscuits, parakeets and a kiss. And, frankly, I am a huge fan of all of those. If you want to know more about me, and the story behind Joe, the lovely Sophie Waters has blogged over at So Little Time For Books.